Iran leader Mahmoud Ahmadinejad offers Egypt "big credit line"
CAIRO Iran's president on Wednesday offered to help rescue Egypt's failing economy with a "big credit line," another possible sign of improving relations between two regional powers after a freeze of more than three decades. Mahmoud Ahmadinejad made the proposal during the first trip to Egypt by an Iranian leader since 1979. It came at a time when his own economy is staggering from the effects of Western sanctions over Iran's suspect nuclear development program, and it was unclear how he could spare funds or credit for his new ally. "It is a smack in the face of the Iranian people," Potkin Azarmehr, an Iranian blogger based in London told CBSNews.com. Azarmehr, a vocal critic of the Islamic cleric-led Iranian government, says many normal Iranians are struggling to make ends meet as the sanctions have forced prices on essentials like food and travel through the roof. The latest bad news for Egypt's economy, meanwhile, came Tuesday with an announcement that the country's foreign currency reserves dropped 10 percent in the past month. Even before that, the treasury warned that the reserves were at a "critical" low point. Egypt's government had no immediate reaction to Ahmadinejad's offer, made in an interview with the state-run Al-Ahram daily. Iran nuke program set to hit overdrive? "We can provide a big credit line to our Egyptian brothers," he told the paper. "If the two peoples cooperate and join forces, they can become an important element." Egypt and Iran have grown closer since President Mohammed Morsi of the Muslim Brotherhood took power in Egypt last summer. The two countries severed relations after the 1979 Islamic revolution and Egypt's peace treaty with Israel the same year. 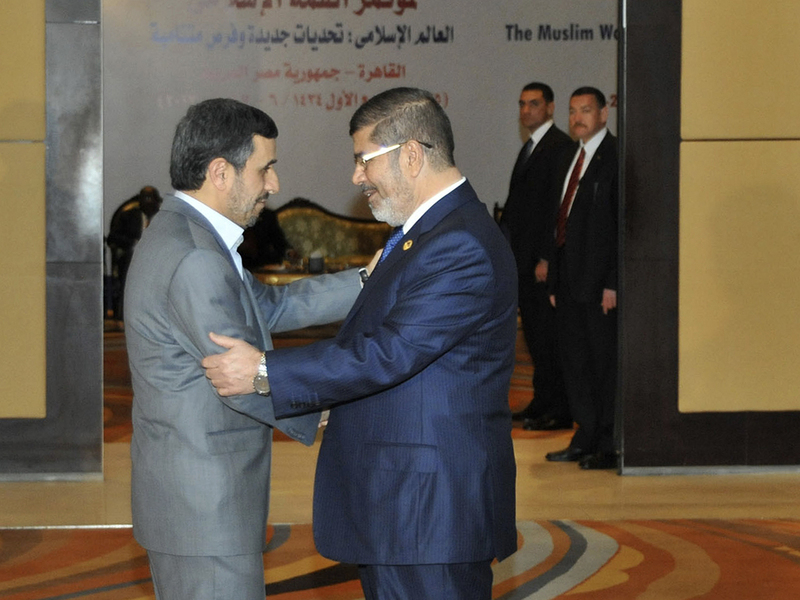 Ahmadinejad is attending an Islamic nations summit in Cairo but arrived a day early for talks with Egyptian leaders. Ahmadinejad's reception in Egypt has not been entirely welcoming. On Tuesday, he had to flee an ancient mosque in downtown Cairo after a Syrian protester took off his shoes and threw them at him, an especially grave insult in the Arab world. Iran is Syrian President Bashar Assad's main regional ally in the civil war there. Then Egypt's most prominent cleric chided Ahmadinejad for interfering in the affairs of Sunni nations. Iran is the leading Shiite Muslim power. Egypt and other Mideast nations are predominantly Sunni. In the Al-Ahram interview, he tried to downplay the concerns with a story. "For example, 40 people are sitting in a bus and they differ among themselves, but they are all heading to the same destination and to the same goal," he said in reference to Muslim world. "What is common among us is bigger than our differences."